GPs and pharmacists in east and north Hertfordshire are asking patients to heed their doctors’ advice this winter to ensure that antibiotics can continue to save lives. Every year in England, around three million surgical operations and cancer treatments take place that could pose a life-threatening infection risk without antibiotics. At least 5,000 deaths a year in England are caused because antibiotics no longer work for some infections and this figure is set to rise. Experts predict that in just over 30 years, antibiotic resistance will kill 10 million people a year worldwide – more than cancer and diabetes combined. It’s the time of year when we see an increase in minor infection like coughs, colds and sore throats. Some people think that the best approach is to book an appointment at the doctor to get some antibiotics. But by taking antibiotics when they’re not needed, you could be contributing to a global health crisis. Taking antibiotics encourages harmful bacteria that live inside you to become resistant. That means that antibiotics may not work when you really need them, such as after childbirth, a hip operation or even a chest infection. 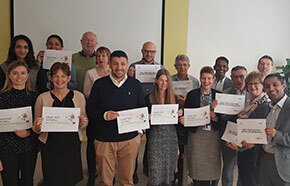 Dr Prag Moodley, GP and Clinical Chair of East and North Hertfordshire CCG, said: “My fellow Governing Body members and I are pledging to be ‘antibiotic guardians’, supporting the wider fight against antibiotic resistance. David Ladenheim, a Pharmaceutical Adviser for East and North Hertfordshire CCG and the organisation’s antibiotics expert explained why doing the right thing with antibiotics is so important: “It is vital that we all use these important medicines responsibly. If we don’t, we are putting ourselves and our families at risk of longer or more severe illnesses. “Antibiotics won’t always clear up your symptoms. If your illness was caused by a virus, as most winter bugs are, then antibiotics will be of no use. It’s only in the small number of cases when you have picked up a bacterial infection, that antibiotics should be prescribed. We now know that most coughs and colds get better just as quickly without antibiotics. Please follow your doctor’s advice and don’t expect to walk out of the surgery with a prescription to collect.